All the harps available can be viewed in the lists below or via the slideshow to the right. For more information regarding any of the harps below (unless specified), to book a viewing or how to list a harp to sell, please contact the Pilgrim Harps store. Horngacher aluminium harp box in good condition. Progress pedal harp, Afrormosia . Good sound, excellent condition all round. Grecian Erard, good condition. Restored by Munson & Harbour 1999. Good playing harp. Excellent sound. Blazdell Grecian 43 string, Black and gilt. Restored by Munson and Harbour 2002. With soft cover and trolley. Malvern 47 string. Perfect condition, wonderful sound. Recently serviced, new bass wires. Aoyama Delphi 47B, Walnut gloss. Excellent condition, really good sound. Recently serviced, all new strings and wires. With soft cover, top cover, base and trolley. Aoyama Amphion 47string Extended board. Pale walnut gloss finish. Superb harp in exceptional condition. Resonant sound. Recently serviced, new bass wires. With House cover, outer cover and base. 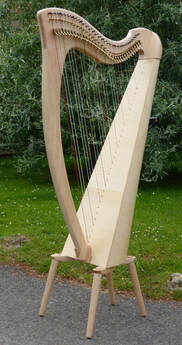 Gorgeous Birch L&H Style 85 - 47 string concert harp. The harp has a unique body and clarity of sound, and has been used in solo performances across many venues in the UK including the Barbican, Queen Elizabeth Hall and Wigmore Hall. This 10 year old L&H harp in great condition. ​Last serviced 3 years ago; bass wires and pedal felts replaced. Clarsach (Scottish Harp), 32 strings E up to A, nice tone, sycamore rounded stained green sound box, horizontal spruce sound board with mother of pearl dots on string rib and brass blades. Towards the end of the 1960s the increasing popularity of instrumental music was evident and groups such as the Corries from Scotland, and the Chieftains from Ireland, were using a wide variety of folk instruments: stringed, wind and percussion. Dr Ian Firth was a professor of physics at St. Andrews University Scotland and not a full-time harp-maker. He became recognised as a harp-maker in the early 1970s at a time when native traditional music was being heard at folk events and harp playing in Scotland was growing fast. Harpists were often invited to his laboratory where he conducted sound frequency experiments. Construction ideas and techniques were mostly based on the 1930s Briggs harps but were sometimes all his own, both solid and reliable. As a result of his work, Dr Ian Firth was awarded the Saltire Society’s John Noble Award for Crafts in the Music Instrument Section 1973/74. He sadly passed away in 2001. Although my 12 year old daughter started learning to play on this beautiful Ian Firth harp, she has outgrown it and I am currently having to hire. The much needed money from the sale will go towards the continuing harp hire and lessons. We purchased this 1996 Pilgrim Ashdown harp in 2008, the idea being to learn to play it, a lifelong idea! Since then it has been much admired, stroked to lovely effect, but never seriously played! When strings snapped, as they do, all by themselves, they have been replaced and the harp re-tuned. In the last month three strings have been replaced and the harp checked over and re-tuned. So it is time to let someone with more time, and determination, to take over its care. It comes with a good transport cover and tuning key, which I have never used, plus its holster, and a couple of books on how to play the harp! Pilgrim Clarsach Afrormosia Satin Finish Comes with Cover, Music, Legs, rubber stubs and Tuning Key. Pilgrim Clarsach Afrormosia Gloss, superb condition. Comes with Case, Padded stool, Tuning Key and Music. The legs on the stool can be used for the harp. Recently serviced. This harp comes with tuning key, dust cover and a travel case. It is in good condition, with a full set of strings. 'FH26' Dusty Strings 26-string harp fitted with Loveland levers. Walnut wood, satin finish with beautifully 'book-matched' soundboard veneer. Nearly new condition; harp includes pick-up, detachable legs and carry case. Beautiful unique Progress Pilgrim harp. Rare type 41 strings - probably the biggest lever harp available. With beautiful painting (Celtic knot) on it's soundboard. Excellent condition, in tune. With its padded bag, tuner, many new spare strings, and books. Wood: Afrormosia, Finish: Satin. Viewing in person is welcome.